One of the (many) perfect things about the Barn that we got for Mum's surprise weekend, was that it was a perfect distance from the Lake District. My parents spent a week in the Lakes a couple of years ago and we knew that they both loved it and wanted to take us there, so the first lake that we visited was Lake Windermere. Lake Windermere is England largest lake at 10.5 miles long and it felt huge! It wasn't very wide but it just seemed to go on and on, especially as we drove along it - I actually thought it was a different lake at one point but no - still the same huge lake. We decided to go on one of the tourist boats heading towards the south of the Lake and Harry loved absolutely loved it. As well as the Lakes, the area is famous for its hills (or Fells) that surround the lakes and these were stunning in the distance and provided the perfect backdrop to the slightly choppy waters. I can definitely understand now why the Lake District is such a popular holiday destination, you definitely get the feeling that you haven't seen everything when you go there... I'm looking forward to perhaps going back one day to explore more. 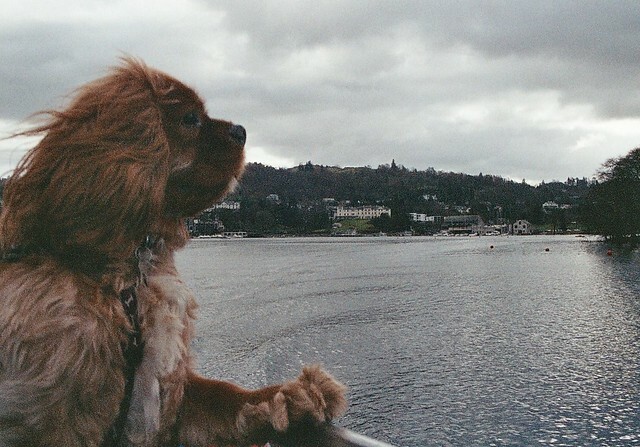 Camera: Yashica Samurai Film: Lomography CN 400 Location: Lake Windermere, England.